Please note that luggage space is limited on Helitours aircraft. To ensure that all passenger baggage is carried onto each flight and no baggage is left behind at the airport, please adhere to the following baggage limitations. Banned, restricted, and dangerous goods are articles or substances which are capable of posing a risk to health, safety, property, or the environment. If you wish to carry or transport any such goods, you should be aware of the regulations and any action you might need to take. All passengers, their hand and checked luggage have to undergo security checks before entering into security restricted areas. Security checks are performed at check points, manually, with technical devices and/or by combining both methods. Potential act of unlawful interferences (i.e. airplane hijacking, sabotage or attack with an explosive device). List of items that cannot be taken on board a flight may be found on the List of prohibited items. Contact your airline or travel agent if you have any questions about what you can take on board. Individual security check is available for passengers with limited movement abilities, with prosthesis and pacemakers, upon their request. Devices used during the security check cannot damage passengers’ electronic devices (laptops, cameras, IPod etc) or photographic films. Liquids cannot be transported in hand luggage unless packed in individual containers/packages whose capacity does not exceed 100 ml or 100 gr, and unless they are contained in the re-sealable transparent plastic bag with a capacity of no more than 1 litre. Transparent cosmetic bags can also be used to store liquids in the hand luggage. The content of the plastic bag has to be clear and visible, and the bag completely closed. Liquids include: gels, pastes, lotions, liquid/solid mixtures, toothpastes, hair gels, drinks, syrups, contents of pressurised containers (shaving foams, deodorants and similar articles). Liquids purchased at the airport of an EU member state under condition that the liquid is contained in a sealed transparent bag with clear specification that the liquid was purchased on the same day and at the same departure airport. Passengers can also contribute to more efficient and faster security screenings. Prepare timely for the flight and inquire about the items that cannot be taken on board a flight. Only pack, in both hand and checked luggage, those items/things that are in compliance with the List of prohibited items and rules on liquids and dangerous goods – in order not to risk potential flight ban or seizure of luggage. 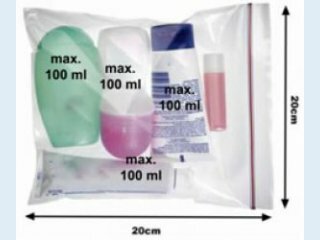 Liquids transported in hand luggage (only in containers with capacity of 100 ml or less) have to be contained in the plastic bag as specified. Arrive to airport in timely manner to avoid potential delays and stress during the departure procedure. If you are carrying a fire arm, report it immediately to the check-in personnel. When preparing for the security screening of passengers and hand luggage, store metal jewellery, watches, coins and similar items in the hand luggage in order not to misplace or forget them, or place them in the plastic tray for the x-ray check. When preparing for security screening of passengers and hand luggage, remove the bag with the liquids from the hand luggage. When preparing for the security screening of passengers and hand luggage, remove the laptops and other larger electronic devices (such as gaming consoles, digital photo cameras and recording cameras) from the hand luggage and place them in the plastic tray so they can be separately checked. Remove your jacket and/or coat and place them in a plastic tray for a separate check. Be prepare to remove your belt and/or take off your shoes and to place them in the plastic tray for separate check if requested by the security officer. Follow other instructions given by the security officer. Dangerous goods are substances and items, which present a risk to health, safety, property and to environment. 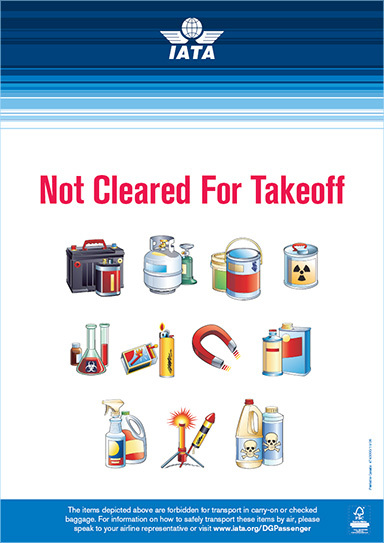 Dangerous goods must not be carried in or as passengers checked or carry-on baggage and are not permitted on one's person. POISONOUS AND INFECTIOUS SUBSTANCES such as cyanide, arsenic, various insecticides, mercury, viruses and bacteria, and the like. purposes, personal care or assistance to people with special needs are certain exceptions for items or substances that are used for medical. For more details on the transport of dangerous goods please contact your airline before the day of travel.